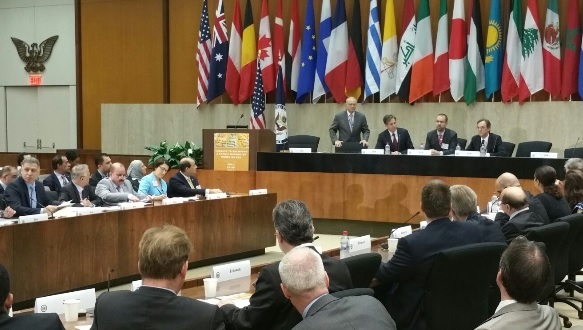 Washington, DC, USA (us.gov.krd) – The United States Department of State hosted a meeting of representatives from 30 countries, the European Union, UNESCO, UNHCR, Organization for Islamic Cooperation and the United Nations to discuss ways that the international community can help protect the religious and ethnic diversity of regions that have been under control by the Islamic State of Iraq and al-Sham (ISIS). Delegates from the Kurdistan Regional Government (KRG) participated as part of the Iraqi delegation, alongside representatives of the Yezidi, Assyrian and Turkman communities and the Iraqi Embassy on July 29. The meeting was hosted by U.S. Ambassador-at-Large for International Religious Freedom David Saperstein and Special Advisor for Religious Minorities Knox Thames. Today’s meeting is a follow-up to the Paris conference in September 2015 where a plan of action was agreed upon. A follow-up to this conference will be hosted by the Spanish government in the coming months. The previous day, Representative Abdul Rahman attended a meeting on the same topic with members of civil society institutions, hosted by the Religious Freedom Project at Georgetown University. Erbil, Kurdistan Region, Iraq (cabinet.gov.krd) – Kurdistan Regional Government Prime Minister condemns the terrorist bombings in Qamishli, which killed dozens of people. 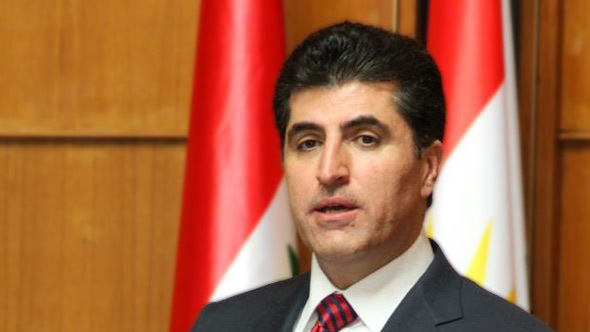 In a statement, Prime Minister Nechirvan Barzani stated that his government is ready assist the victims of Wednesday’s terrorist attacks. I strongly condemn the terrorist attacks in Qamishli, which claimed the lives of dozens of civilians. I convey my condolences to the families of the victims, and wish a speedy recovery to the injured. By committing this heinous crime, terrorists have once again proved that they are true enemies of the Kurds and humanity in general. However, the Kurds will remain steadfast in the fight to eliminate terrorism in the region. The Kurdistan Regional Government is ready to use all its resources to assist those affected by the terrorist attacks. Erbil, Kurdistan Region, Iraq (cabinet.gov.krd) – In a statement, Prime Minister Nechirvan Barzani condemned the shooting yesterday in Munich, Germany, which killed a number of civilians and wounded others. A gunman opened fire on people in a shopping centre in Munich, killing nine and injuring 16, most of whom were children. Washington, DC, USA (us.gov.krd) – The KRG Representative to the United States joined Foreign and Defense ministers from 42 countries from the Global Coalition to Counter the Islamic State of Iraq and the Levant (ISIL) on Thursday as part of the delegation from Iraq. Bayan Sami Abdul Rahman attended the meeting hosted by US Secretary of State John Kerry, US Secretary of Defense Ashton Carter and Special Presidential Envoy Brett McGurk, which was held to discuss priorities for the Coalition’s multiple lines of effort to degrade, defeat and destroy ISIL, including political-military coordination, combatting foreign terrorist fighters, counterterrorist financing, counter-messaging, and stabilization of liberated areas. The Iraqi delegation was led by Foreign Minister Ibrahim Al-Jaaferi and Defense Minister Khalid Al-Obeidi. Also in attendance were Secretary General of INTERPOL Jurgen Stock, UN Special Representative and Head of UN Mission in Iraq Jan Kubis, and Deputy Assistant Secretary General of NATO James Appathurai. The meeting follows the Pledging Conference in Support of Iraq on Wednesday, which raised over $2 billion for the security and humanitarian response. Erbil, Kurdistan Region, Iraq (cabinet.gov.krd) – Prime Minister, Nechirvan Barzani yesterday received Mr. André Vallini, French Minister of State for Development and Francophonie, attached to the Minister of Foreign Affairs and International Development, accompanied by a diplomatic delegation. Mr. Vallini commended the role of the Kurdistan Region, its government and Peshmerga forces in the fight against ISIS, protecting ethnic and religious minorities and accommodating a very large number of refugees and internally displaced persons, who fled the areas under ISIS control. He reiterated his country’s support to the Kurdistan Region. Mr. Vallini pointed out that his government is looking at how to help the Kurdistan Region to overcome the current financial crisis which it goes through, as well as further strengthening bilateral relations in various fields. Prime Minister Barzani thanked Mr Vallini for his visit and presented his and Kurdistan Regional Government’s condolences and heartfelt sympathy to France and the families of the victims of Nice terrorist attack. He also expressed his government’s gratitude for France’s humanitarian and military support to the Kurdistan Region. Prime Minister Barzani discussed the current situation in Kurdistan Region and the hard financial crisis which it goes through. He expressed his hope that to overcome this difficulty, France will offer its expertise and knowledge as an experienced country to the Region. He stressed that it is a source of pride that the Peshmerga forces fight the most brutal terrorist organisation on behalf of the entire world, pointing out that his government did all what can be done to accommodate a large number of displaced people and refugees. He said, however, this situation is unsustainable for the Kurdistan Region without further help from the international community enabling the government to provide further needed services to the displaced and refugees. He also praised the role of France at the G7 meeting, in supporting the Region economically within the framework of the loans to be allocated to Iraq. The two sides also discussed the anticipated operation of liberation of Mosul and its aftermath, as well as Iraq’s and Kurdistan Region’s political and security situations. Erbil, Kurdistan Region, Iraq (cabinet.gov.krd) – Kurdistan Regional Government Prime Minister Nechirvan Barzani says education is the key to success and progress in Kurdistan. Prime Minister Barzani says, development and prosperity are achieved through the advancement of Kurdistan’s education system. Mr. Barzani made the statement during a special ceremony held on Tuesday in Erbil to honor top students for 2015-2016 academic year in the Kurdistan Region. In a speech during the event, Prime Minister Barzani congratulated honor roll students and their families. He thanked teachers and the Ministry of Education for concluding a successful academic year. In the ceremony, the Prime Minister awarded the honor roll students and wished them a continued success. For this year’s academic year, more than 300,000 high school seniors and ninth grade students participated in theministerial exams at more than 5,000 centers. More than 60,000 teachers and observers supervised the process. Erbil, Kurdistan Region, Iraq (cabinet.gov.krd) – Kurdistan Regional Government condemned the terrorist attack in Nice, France, that killed dozens of civilians. In a statement Friday, the Council of Ministers expressed its solidarity with the people and leaderhip of France. We condemn, in strongest terms, the terrorist attack against cilivians in the southern city of Nice, as they gathered to celebrate French National Day. Last night’s attack, one of a series of terror attacks against France in recent years, claimed the lives of dozens of innocent people. Kurdistan Regional Government stands in solidarity with the people and leadership of France and the families of the victims, and they have our full support. Nice terrorist attack is another reminder that the international community is facing a major challenge and responsibility to contain and eliminate terrorism. Terrorists commit heinous crimes anywhere and at anytime, if there is a chance to do so. Repeated terrorist attacks in France and other countries highlight the need to intensify international coordination and cooperation to swiftly defeat terrorism, and protect the world and humanity from the threat of terror. Again, we stand in solidarity with the people and leadership of France and express our sympathy and condolences to the victims’ families and loved ones. Salahaddin, Erbil, Kurdistan Region of Iraq, (presidency.krd) – Kurdish and American officials sign a memorandum of understanding that includes provisions of military support to the Peshmerga forces. The acting Minister of Peshmerga Affairs Karim Sinjari and the acting Assistant Secretary of Defense for International Security Affairs Elissa Slotkin signed the memorandum on Tuesday. Prior to the signing of the agreement, Kurdistan Region President Masoud Barzani met with the U.S. delegation headed by Ms. Slotkin. The meeting followed a telephone conversation between President Barzani and the U.S. Secretary of Defense Ashton Carter. President Barzani and Ms. Slotkin discussed the liberation of Mosul and the preparations of the Coalition, Iraqi and Kurdish forces. President Barzani focused on the importance and urgency of the liberation of Mosul and used the opportunity to highlight the utmost importance of planning for post-liberation of Mosul. Ms. Slotkin stated that the Peshmerga forces will play an essential role in the Mosul operation just as they have played similar roles in other operations against the terrorists of the so-called Islamic State. President Barzani expressed his appreciation to the American people and the U.S. administration for their support to the Kurdistan Region and for leading the collective effort to eliminate terrorism.